Today we meet two famed ladies here at the salon; one is a painter, the other the queen who became her friend and muse. 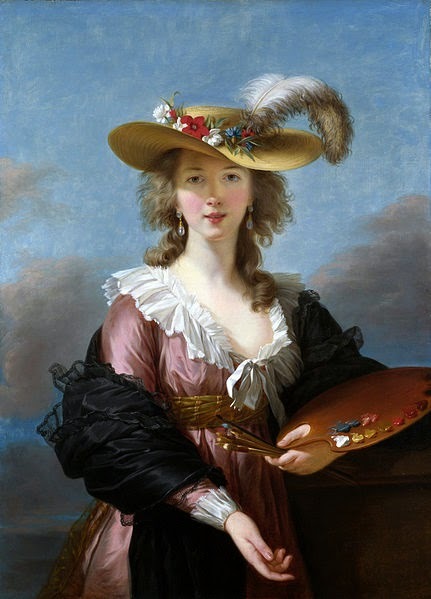 Together, Louise Élisabeth Vigée Le Brun and Marie Antoinette produced a portrait that both started a fashion and caused a scandal. Born on this day, Le Brun was a noted and celebrated portrait artist of her day and when she was invited to paint Marie Antoinette at Versailles, it was the start of an enduring friendship and new chapter in the artist's career. 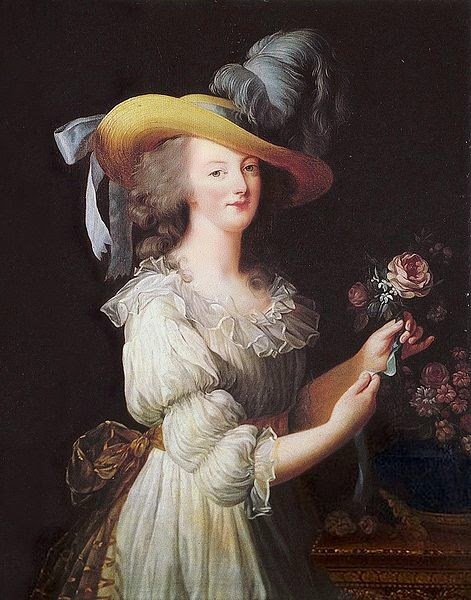 Today I shall look at my favourite of the many portraits of Marie Antoinette that the wonderful Le Brun painted, the somewhat controversial La Reine en Gaulle, completed in 1783. The paintings simple enough and depicts the queen in her gaulle, also known (as a result of the painting) as the chemise a la reine. This light, simple muslin gown was a favourite of Marie Antoinette and she wore it at the Petit Trianon, creating a new fashion trend in the noble ladies of Paris. When she posed for this portrait, the queen was already less than popular with some members of the Versailles court, who viewed her lifestyle with distaste and found the exclusive nature of her inner circle difficult to comprehend. Now, with this apparently simple portrait, the queen put ammunition into the hands of those who disliked her. There is no hint of structure, pomp or, crucially, monarchy evident on the canvas and when the public laid eyes on the portrait during its exhibition at the Salon de Paris, they were horrified. Rather than a woman in an informal garment and in informal setting, they found themselves looking at what appeared to be a portrait of a queen in her underwear. The work was quickly withdrawn and replaced with the quickly produced, far more formal portrait seen below. Although Marie Antoinette retains her rose, she is once more seen in her familiar structured court dress. I adore the simplicity of the painting; it's nice to see Marie Antoinette dressed down a little, perhaps showing us a little more of the woman behind the queen. After the painting was displayed Marie's new, dressed-down look became instantly fashionable. As the women of the upper classes began to buy less silk and satin, the Queen found herself accused of deliberately sabotaging the nation's fabric industry in favour of imported textiles. In addition, there were whispers that she was trying to undermine the monarchy by allowing herself to be painted as a simply-dressed woman rather than a primped and gowned queen. Marie Antoinette would not be painted so informally again, but the damage was already done. Thank you. It is funny to think that the painting was criticised precisely because it is so simple, yet that's what appeals to me about it! Or maybe public figures will always be criticized by someone no matter what period deserved or otherwise. I think there's definitely some truth in that! Wow this is a different side that is very attractive of the queen I never would have guessed. Not that I know much about her but this appears to be her real side. Thank you; it's nice to see a more informal side to her! The Antonia Fraser biography of Marie Antoinette is sympathetic to her and outlines the inevitable negative reactions to everything she did. Married off young, still dominated by her mother and trying to make the best of a difficult marriage and claustrophobic court life, her destiny was always to be misunderstood and criticised. But her end was still a pitiful and tragic one. These very young women always make me think of the miserable life that so many of those born into the upper reaches of society led, their existence more important as chess pieces for the games of the powerful families around them than as human beings. 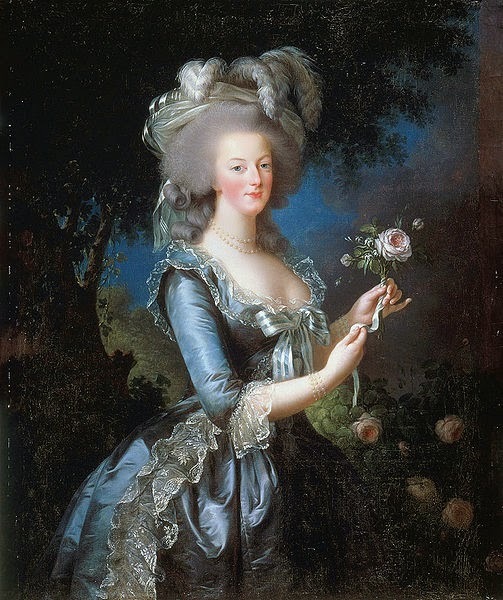 Marie Antoinette probably particularly exemplifies such misfortune, ending as she did. I have to admit whenever I think of her I also think of Madame deFarge in Tale of Two Cities, and her unblinking hatred, however justified it might have been. Poor girl; poor woman. It must have been utterly bewildering at such a young age, and so difficult to finish growing up as a court wife! Marie hated wearing the court dresses and corsets. She found them uncomfortable.